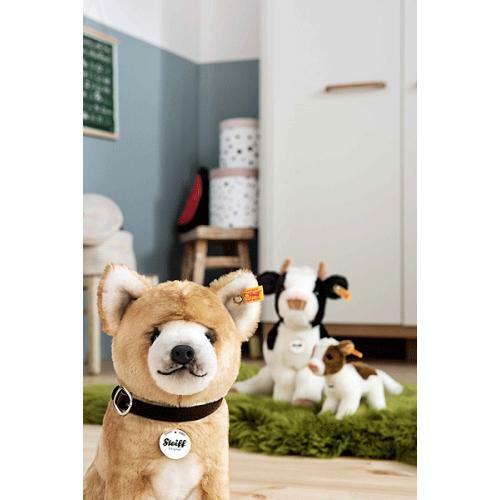 Steiff Luise Calf is made by hand, in the finest black and white cuddly soft plush. 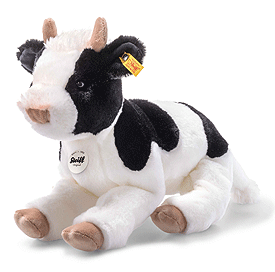 Luise calf is 32 cm tall and made of soft and cuddly black and white plush fabric. Her hooves and the soles of her feet are beige, just like her nose and horns. Luise is quite proud of her characteristic hairdo made with long cream-coloured plush fabric. She also features a little tuft of hair just above her nose. The pink shading on the nose puts the finishing touch on Luise's friendly aura. After a day full of frolicking on the farm, this little calf just decided to lie down and get some rest.